This sunny afternoon, I’ve had a chance to make some reading lists and also take a closer look at two pieces of scholarship, including Paul Beck’s, Columns of Vengeance: Soldiers, Sioux, and The Punitive Expeditions, 1863-1864 (Norman: University of Oklahoma Press, 2013) and Clifford Canku (pronounced Chan-ku), Nicolette Knudson and Jody Snow, Tokaheya Dakota Iapi Kin: Beginning Dakota (St. Paul: Minnesota Historical Society Press, 2011). As Beck says in his introductory remarks, this is a Euro-Ameri-centric work from the bottom-up, soldiering perspective. What this means is that Beck worked all sorts of data from soldiers on these punitive campaigns into this 2013 history. When thinking about this, it’s interesting to consider how the professionally-trained soldier perceived of their duties and the Dakota they were charged with campaigning against vs. how the volunteer soldiers mustered in locally from Minnesota and the area perceived the Dakota. With this known, readers shouldn’t get upset that this is, well, another Euro-Ameri-centric work of the punitive campaigns (also a Euro-Ameri-centric phrase) in Dakota Territory. 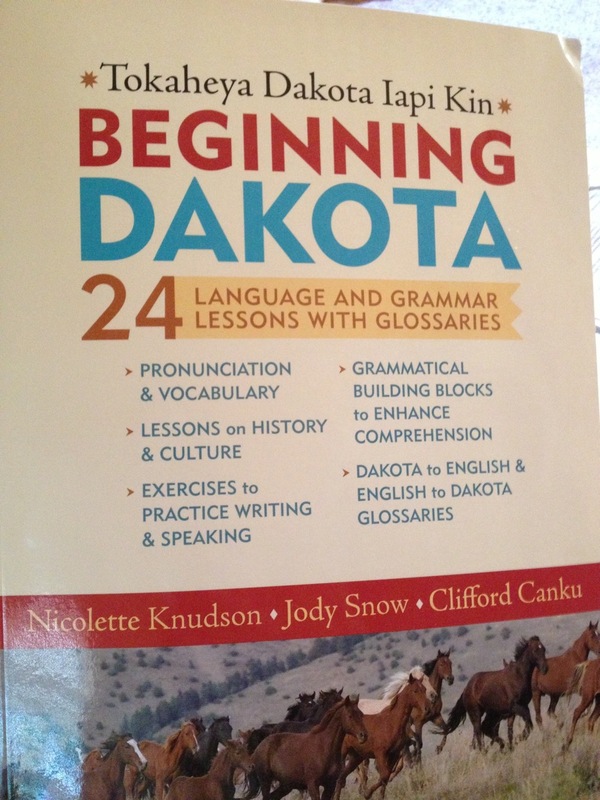 Even though the NCAA banned the use of the word “Sioux,” (and as a North Dakotan, I am fine with that) Beck and the editorial staff at the University of Oklahoma Press have not. I suppose the title is reflective of the view this history takes. Some thoughts on that below. As Canku and company point out in Tokaheya Dakota Iapi Kin, and as more and more increasingly become aware of, the word Sioux was developed by the Algonquian to the east. As the French were making their way around the Great Lakes region, they encountered these Algonquian, and when the said Algonquian were asked, “Hey, who is to the west of you?” they responded with the Algonquian name for the Dakota, which was “Sioux.” The definition of Sioux is “those who live near the snaking river.” More pejorative variations on this have taken the name of “Snake in the grass.” But the problem of the word “Sioux” in and of itself is that it has been elevated to the known name of a people who did not author it as their known name. It’d be akin to asking a Russian what you call folks in the region of Poland vs. asking Poles what they call themselves. For the sake of identity (which is the important stuff of being human, having and developing character and a constructive and collective image of oneself and the world) it’s important to keep hammering away that the Sioux are not in fact “Sioux.” Rather they are Dakota, Lakota and Nakota. More specifically, the Dakota are composed of the Mdewakantonwan, the Wahpekute, the Wahpetonwan, and the Sisitonwan (this is where the namesake Wahpeton, North Dakota comes from, also the hometown of the Erdrich family, among others). The Lakota are the Ti’tonwan, and the Nakota are the Ihanktonwan and the Ihanktonwanna (where the name Yankton comes from). The word Dakota means ally or friend. This entry was posted on Sunday, June 30th, 2013 at 2:42 pm	and tagged with Clifford Canku, Dakota, Lakota, Nakota, Paul N. Beck and posted in Uncategorized. You can follow any responses to this entry through the RSS 2.0 feed.